I’ve started working on converting Nautilus to use the gio API instead of gnome-vfs. Its nowhere near done, but today I finished converting the basic file information reading and handling to gio. Here it is, in all its glory! Of course, it looks exactly the same as before, but its new and shiny on the inside. The code is available in the “nautilus-gio” branch in subversion. At the moment it only works with the standard gio local files backend. If you install gvfs it crashes due to some dbus mainloop integration conflict issues. Will gvfs solve the problem with gnome-vfs that anything that links to libgnomevfs-2 will be linked to a lot of libraries that are not really needed (like krb5suppor, gssapi, ssl) that add startup + footprint overhead to any gnome application? 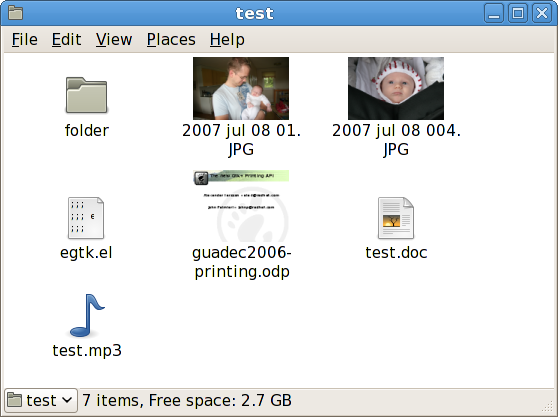 As more and more file-types gain some kind of thumbnail image, I really start to miss meaningful file type icons. It looks the same, but we can feel the power! what advantage does the change bring? m: Yes, apps will link only to dbus (and libgio/gvfs).